As a car owner, you know just how much it costs to purchase a car. Because it is such an investment, you need to do your best to keep it looking and working at its very best. This spring, don't forget to give it a thorough cleaning to remove any leftover grime from the winter season. From road salts to mud, get all off and gone with these tips. Before getting started on your car's exterior, focus some much needed attention on its interior. Start by wiping down the surfaces inside your car's cabin. This includes the dashboard, center console, the steering wheel, and the doors. When wiping down the center console, pay extra attention to the cupholders since spills tend to be common in this area. Be sure to use a damp rag to get this job done since this will work best to trap the dust you're wiping away. Using a dry rag will only throw the dust into the air, allowing it to settle on your surfaces once again. Finally, finish off by cleaning the glass parts, like the windshield and the windows. Once the dust has been removed, focus your attention on the carpet and the seats. Remove your car's mats and set them aside for now. Grab your vacuum and all of its attachments to that you can get the deepest clean. Vacuum up any crumbs, dust, and dirt on your seats and carpets. Don't forget to also push your seats back so that you can reach all of the dust hiding underneath. It may also help to keep a trash bag nearby so that you can toss any trash you find hiding in your car. Once that's all done, shake out your mats to remove as much dust from them as possible. Next, use your vacuum to give them an even deeper clean. The last interior space that will need to be cleaned is your trunk. After the winter, you may have forgotten all the seasonal items you threw in your trunk. To get rid of the excess weight you're carrying around, empty your trunk out completely. Separate the items you find into a few piles: seasonal items to be stored, items that belong in your home, trash, and items that need to stay in your trunk. Once everything has been sorted, grab your vacuum once again and get to work on removing all the debris in your trunk. Once the space is as clean as it will get, it's time to place your items back in the trunk. The rest of the items should be stored in their rightful place. Spring cleaning your car isn't just about making it look nice, it can also keep your car in better shape. To ensure it stays in the best shape, keep up with regular maintenance, including synthetic oil changes in Chambersburg, PA. To find the best AMSOIL Oil products for your next oil change, contact Cerberus Systems, Inc. at (717) 658-1256. They will be happy to recommend products like AMSOIL Oil's Signature Series 0W-20 Synthetic Motor Oil. Now that your car's interior is sparking, it's time to focus on the exterior. 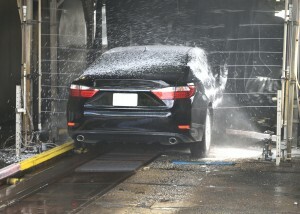 You can either head over to your favorite car wash or take the job on yourself. You can easily wash your car yourself, you just have to make sure you're using the rights tools. Avoid using harsh chemicals that can damage your car's paint job and rags or sponges that can do more damage than good. Pay extra attention the headlights and the undercarriage as you get to work. Tires tend to pick up a lot of dirt and grime because the are literally on the road. After a rough winter, your tires will probably show some clear signs of use, so focus on removing all this built on dirt. Once your tires are nice and shiny, examine them to ensure they're still in good condition. Check the tread for excessive wear and the tire walls for signs of damage. If they are heavily worn, now is the perfect time to invest in a new set. Finally, give your car a layer of protection against the elements by waxing it. Although wax can make your car shine in the sunlight, it also serves a very useful purpose. A layer of wax will protect your car from the sun's harmful rays as well as from corrosive elements like rain and other moisture. Now that your car is nice and clean, it's time to take care of some maintenance. Start by giving your car a synthetic oil change in Chambersburg. Contact Cerberus Systems, Inc. at (717) 658-1256 or stop by their online shop to check out a full range of their products.